I love when I discover something new, interesting, or fabulous while at work. It’s such a treat! On Tuesday, my photographer, Eric and I were in Holyoke. The story, Austin Renaud, one of the six accused of bullying a girl so much she committed suicide, was arrested for drunk driving in Holyoke over the weekend. Renaud was in court on Tuesday. It’s an awful story, which is why my little discovery was such a bright spot. 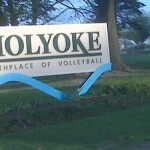 Upon entering Holyoke there was a sign that said this was the birthplace of volleyball. How cool is that? Then on our way to Springfield, where Renaud now lives, I was reminded that’s the birthplace of basketball. 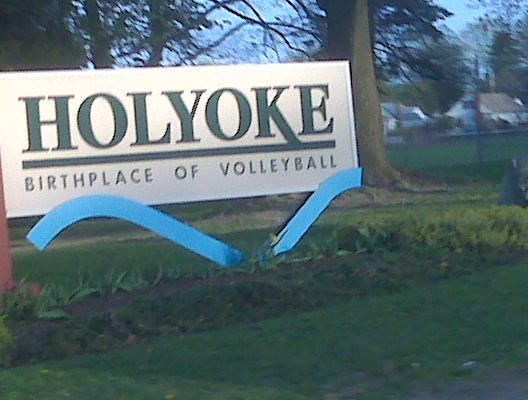 With a bit of online research I found that William Morgan, Holyoke YMCA’s Director of Physical Education back in 1895, invented volleyball. He originally named it Mintonette. But during a demonstration of the game, a spectator commented on the “volleying” entailed, hence the name change. And just four years earlier, over at the Springfield YMCA, James Naismith a physical education instructor introduced the game of basketball to a group of young men. The object was to throw a ball into a basket that was tacked onto a balcony 10 feet off the ground. So there you have it the birthplace of two sports within miles of each other. I played volleyball in high school and wish I had a picture to share, because I looked pretty dorky. Maybe that thought will be the bright spot in your day!